Becherovka is an herbal bitters made in Karlovy Vary (German: Karlsbad) in the Czech Republic by Jan Becher. It is flavored with aniseed, cinnamon, and approximately 32 other herbs. Its alcohol content is 38% ABV (76 proof). The entire production process and the exact mixture of the many herbs and spices used in the drink's creation are a closely guarded secret. Left: A bottle of Becherovka. 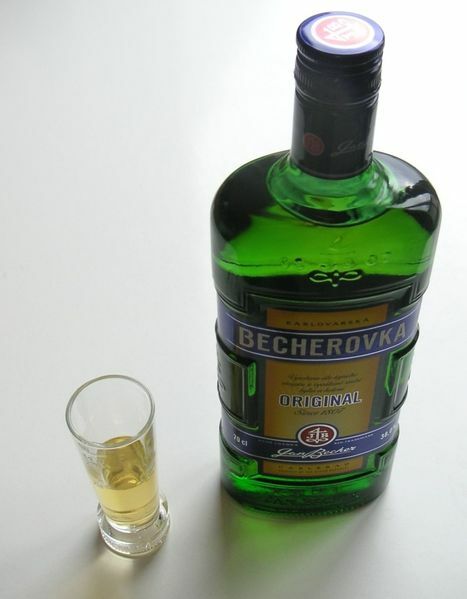 Becherovka is usually served cold and is often used as an aid to digestion. It may also be served with tonic water, a drink that is known as a beton (Czech for "concrete"). It is used in several former Eastern Bloc countries as a home remedy for arthritis and as an emetic.